This is a Xbox360 video game! This is a video game designed for the Microsoft Xbox360 console. You will need a console that has modified firmware. We recommend latest ixtreme firmware 1.0 to 1.2 rev.c. or newer. All games are stealth patched. Return to the vibrant world of Albion in this follow-up to 2004's Fable. Acclaimed developer Peter Molyneux has crafted an action role-playing game filled with moral choices, allowing you to create an altruistic or evil character based on your decisions. You begin the game as a boy or girl and will eventually mature into an adventurous adult. Explore the lush countryside, fight bandits, slay foul creatures, venture into mysterious dungeons, marry, or raise a family. Your fortune amassed during your travels can be spent on houses, castles, taverns, clothing, equipment, tattoos, and more. Your actions will literally change and shape the world, and the townsfolk will react accordingly. The setting takes place 500 years after the original game, enabling you to use guns in combat as well as swords, bows, and spells. Fast-paced combos can be strung together by alternating between magical, ranged, and melee attacks. 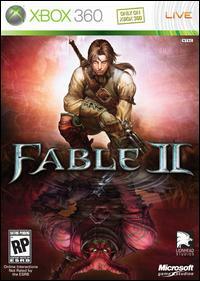 Fable II also features a canine companion that will perform tricks, dig up treasure, and protect you in combat. Cooperative play is supported via Xbox Live, allowing a friend to seamlessly join your world at any time. Xbox Live subscribers can also build their fortunes outside of the main game by playing Xbox Live Arcade's Fable II Pub Games. Money and prizes earned while playing the three games of chance can be transferred to your character. Acquire too much debt, however, and "collectors" might come looking for you.